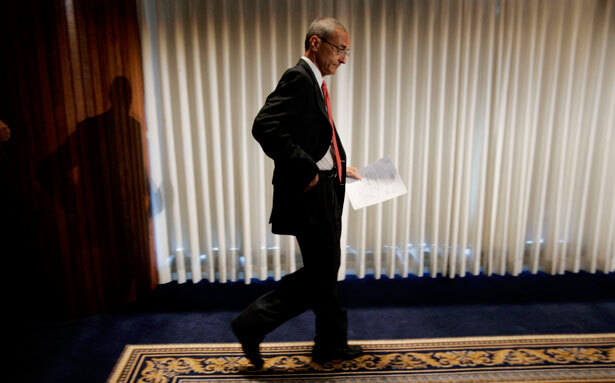 John Podesta is just the latest to make use of the White House’s revolving door for lobbyists. How can President Obama be so right and so wrong in the same moment? On the one hand, he warns us that sharply rising income inequality “is the defining challenge of our time” and pledges to reverse “a dangerous and growing inequality and lack of upward mobility. …” But then he once again turns to the same hacks in the Democratic Party who helped create this problem to fix it. His tough speech on income inequality earlier this month was delivered at the Center for American Progress, founded by John Podesta. As chief of staff to Bill Clinton, Podesta helped lead the charge to deregulate Wall Street, which resulted in the banking bubble that wiped out the savings of tens of millions of Americans. But instead of chastising Podesta for the errors of his ways, Obama in 2008 appointed him to oversee his presidential transition team. That led to the appointment of Lawrence Summers and Timothy Geithner, two former Clinton officials responsible for the banking meltdown, to repair it. Just this past week, it was announced that John Podesta would be reappointed as a senior adviser to the Obama White House. John Podesta should not be confused with his brother Tony, although both were founding partners of the Podesta Group, a lobbying firm that has represented Walmart, Lockheed Martin, Bank of America and BP along with dozens of other multinational corporations. Tony still heads the lobbying firm, but John left when he joined the Clinton administration and subsequently founded the Center for American Progress, a think tank that attracts major funding from defense, energy and pharmaceutical companies. Sometimes the Podesta brothers work on opposite sides of the policy street, but both are big contributors to the Democratic Party, and it doesn’t hurt for lobbyist Tony to have the same last name as brother John, an Obama insider. “Some prospective clients, in fact, will contact Mr. [Tony] Podesta because of his brother’s ties to Mr. Obama,” The New York Times reported in a 2010 profile on Tony. The newspaper quoted him as saying, “People approach us and say, ‘Can you call your brother and get him to call the president?’ and we’ll say, ‘No.’ It’s not what we do. We don’t do access lobbying.” Sure you don’t, but anyway, John, when he periodically moves out of the White House revolving door into the Washington policy swirl, milks the same types of corporate clients as his brother. Podesta will be welcomed at the White House by chief of staff Denis McDonough who was a senior fellow at CAP, and Obama communications director Jennifer Palmieri who was a lobbyist for the organization. They are the faces of the so-called progressive wing of the Democratic Party that, like the president himself, will talk a good game of reducing income inequality, while catering to the interests of the very corporations that have initiated the problem. The pattern was set by Obama when, in his successful race for the presidency, he decided to shun public financing and instead shamefully courted the Wall Street fat cats who bankrolled him handsomely. It is not surprising then that in his major speech on income inequality, there was no mention of the role of the big banks in fostering this inequality. The Podesta brothers are not your typical family, but Obama hasn’t noticed.